When Greenery was announced as 2017 Pantone Colour of the Year I was ecstatic. I love the rich tones of foliage and had already gathered a few favourite clothing pieces in this colour so I didn't need much encouragement to go out and get more! The colour really does exude nature, happiness and rejuvenation, and can be worn across seasons. My favourite way to wear the colour includes jungle print during summer and it can be used as a solid colour for winter dressing. 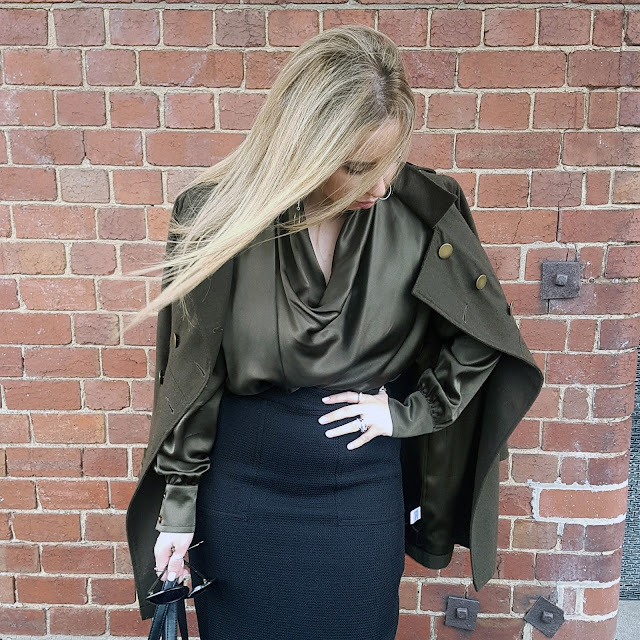 This week I felt cosy in my winter staples, pairing a green vintage Escada blouse with a Mink Pink green military style coat. Do you have pieces in this years Pantone Colour of the Year? Comment below how you wear Greenery!